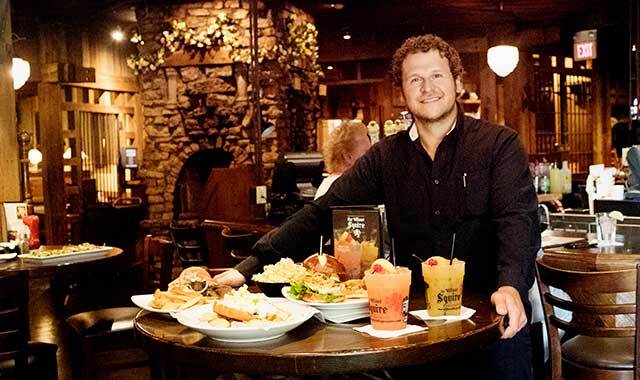 Aleko Karas, owner and general manager of the Village Squire’s McHenry location, is keeping up the vision his father, George, and uncle Paul had when they launched the restaurant in 1974. The Village Squire is now a favorite destination for diners in four locations: McHenry, Crystal Lake, West Dundee and South Elgin. The story behind the Village Squire restaurant goes back to a farming community in northern Greece where the Karas family grew up. Ripe for adventure, brothers George and Paul Karas immigrated to the United States and settled in the Fox Valley area, intent on pursuing the American dream. The land of opportunity did not disappoint. In 1974, the siblings, who had started working in restaurants, ended up buying one. Their flagship Village Squire Restaurant in downtown West Dundee was a hit. A few years later the family-owned and -operated business added a Crystal Lake outlet, followed by one in McHenry and, in early 2000, South Elgin. The decor is English pub-style. The look and feel of the four restaurants has not changed appreciably, says Aleko Karas, George’s 32-year-old son who owns the Village Squire in McHenry and serves as its general manager. “We still use wrought iron, big stone and brick, plus reclaimed barn wood on each property,” Aleko says. Fish and chips, steaks and chops, and Angus pub burgers are menu standards, but dining options are expanded considerably to address diverse appetites. Mediterranean roots reflect Greek flair wherever possible. “Believe it or not, the Grecian items on the menu are the most popular,” says Aleko. Executive Chef Grant Werner’s seasonal menus basically mimic one another at each Village Squire location. Seating capacity at the McHenry branch is about 190, including a semi-private party room that can accommodate 60 for reunions, birthday celebrations, rehearsal dinners and other special events. The other three locations bear similar accommodations. Diners will find a generous collection of domestic and imported beers, including a few craft brews and a half-dozen drafts. Spirits are well represented. Aleko says Mai Tai and Rum Barrel stand out as the bar’s leading cocktails. Wines are mostly domestic and largely from California. Flat-screen TVs around the bar keep patrons current on their favorite sports teams. Aleko says the key to success in this business is to pay attention to what’s going on within the four walls of the restaurant. Attentive service, matched with consistently high-quality, well-prepared and equitably priced food has to be the baseline. It’s all about how well staff interacts with each other and how they treat guests. The people factor is paramount. The payoff translates to return customers and word-of-mouth that attracts new diners. “That’s the goal,” Aleko adds. A dedicated and knowledgeable staff, from servers to food preparers to managers, can create an inviting atmosphere diners will want to revisit, Aleko says. The Village Squire serves lunch and dinner daily at four locations: 4818 Northwest Hwy., Crystal Lake; 125 Washington St., West Dundee; 4512 W. Elm St. McHenry; 480 Randall Road, South Elgin. Hours vary by location. This entry was posted on Monday, September 24th, 2018 at 11:59 am	and is filed under Dining Guide. You can follow any responses to this entry through the RSS 2.0 feed. Both comments and pings are currently closed.